Let us hold that for you. Our iPad stands make your apps easier to use. Vacuum Suction you can trust. 3 Pumps and you are locked and loaded. You’ll enjoy books and movies in comfort, with this flexible iPad holder for bed. Move your tablet stand to the couch or sofa for hands-free, eye-level relaxation. Get inspired by your portable iPad stand. Take photos with a collapsible tripod mount. 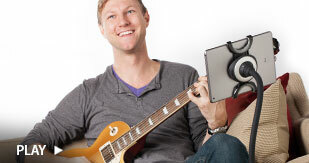 Make melodies with a music stand for your digital device. Take your muse everywhere! The workday goes faster with a mobile device. 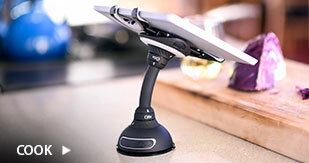 At the office, warehouse, store, or workshop, this iPad stand keeps your technology conveniently close. Use it on Android and Windows tablets too! 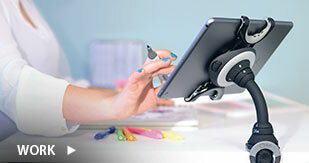 Whether you study at your desk, in a dorm, at the library, or on the go, this tablet stand has your schoolwork covered. Ditch the heavy backpack. Let this sleek stand hold digital textbooks instead. Create culinary perfection with the help of your technology. With a kitchen mount for your tablet, you’ll make more space on the counter. Recipes and cooking tips will never be far from reach. 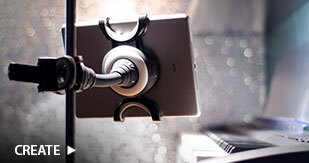 This flexible iPad stand holds any tablet, anywhere. Create your own mobile entertainment station! Wherever you go, you’ll enjoy unparalleled access to media and apps.